I’m months late reporting about this, but PostShow posted a link to Microsoft Research Asia (read: Beijing)’s Chinese New Year couplet (i.e. coupled greetings) generator. 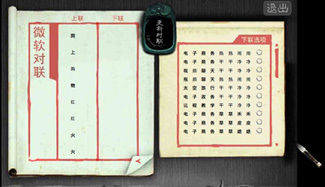 Not much new, but I appreciate the incorporation of Chinese calligraphy elements in the user interface.